I just spent some time with the New Nintendo 3DS at the Tokyo Game Show, and based on first impressions, the upcoming handheld looks like it could be great. Announced last month, the revamped 3DS features more powerful hardware, a better 3D effect and a new analog controller called the C-Stick. It's less a stick and more a nub—much like the ThinkPad keyboard nub. So, how is it? In the Monster Hunter 4G demo, the C-Stick was used exclusively for the camera. Since it's a small nub, that seemed ideal for camera movement in that you can easily push it. I tried pushing on it as hard as I could to actually see if I could break it, but the nub appeared very sturdy. I am curious to see how it will hold up over extended play. However, this C-Stick isn't really something you can flick, which makes me wonder how it will feel to use in Super Smash Bros. for 3DS. But, like I said above, the C-Stick is an extremely welcome addition for camera controls. 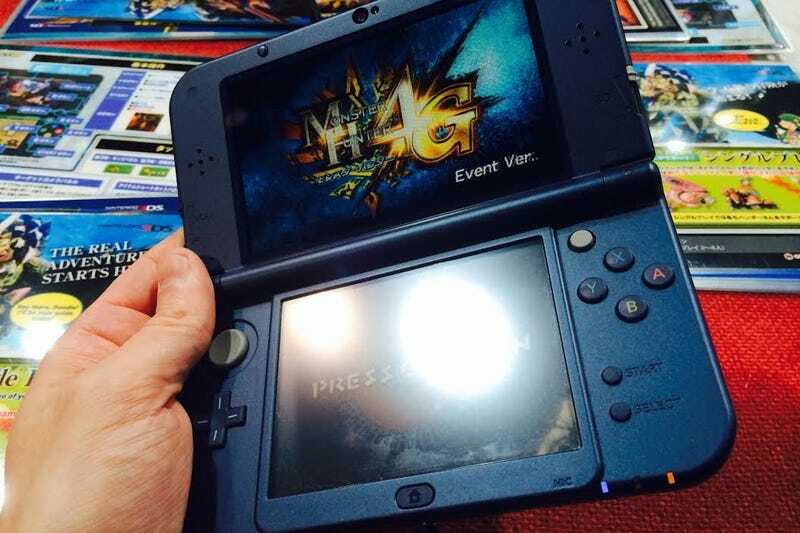 The Slide Pad appears to be the same Slide Pad on current 3DS models, and I personally didn't notice a difference. The Dpad and the face buttons all felt nice (the buttons were slightly clicky), and everything else appeared to be in good working order. The new added shoulder buttons (ZR and ZL) required more of a reach to use, but since they stick out slightly, they were easy enough to use. The back of the handheld, however, was glossy plastic, and I kind of wish Nintendo would have gone with a nice matte finish. The biggest surprise was not the controls. The improved 3D effect is truly improved. It actually surprised me how good the effect looks now. This is something I've long hated on the original 3DS and have rarely used because it made my eyes tired. Instead of making you feel like you are crossing your eyes, the new 3DS effect has more of a shadow-box effect than you get with the current 3DS. Instead of feeling like the game is popping out, it's as though the New 3DS is drawing you into the game. The large XL screen really helps the 3D effect sparkle. Pictures cannot do it justice, but Monster Hunter 4G looked utterly fantastic on the portable. To help pull off the 3D effect, Nintendo installed new face tracking software. You can move your head around and don't have to constantly fiddle with your positioning or the slider to keep the 3D effect. The tracking wasn't completely smooth, however, as there is some herky-jerky panning to calculate the effect. As I was playing the New Nintendo 3DS, I couldn't help but wish this had been the handheld Nintendo launched the platform with. It really seemed to deliver in ways that the original 3DS, a fantastic portable in its own right, does not. And that, no doubt, is the point. The New Nintendo 3DS will go on sale in Japan on October 11. Update: An earlier version of this story said the New 3DS XL screen is larger than the current model. However, the entire New 3DS XL unit is slightly larger, and the New 3DS regular model's screen is larger than the current version.